Rather than making monumental goals for the New Year, I try to come up with lots of smaller, more do-able goals. This is the case with my Etsy shop as much as it is with me personally. The goals tend to be ideas I'd like to implement. Here are a bunch that have been rolling around in my head. Take a look, and we'll look back in a few months and see how many actually got implemented. *Make more stuff. That's easy to understand why. It's great to have some old favorites, but shops alw ays need NEW stuff to keep them fresh and interesting. *Expand the line of items I make for knitters. It's a natural connection -- off Etsy, I'm a pretty passionate knitter. I don't know if I'll ever sell any knitted items (possibly), but I love the idea of a whole line of goodies that cater to knitters. So in addition to the current ones (notecards made with recycled knitting catalogs and stitch markers), I'm think of more stitch markers, cute covered tape measures, knitting-related rubber stamps, and possibly some needle holders for circular needle sets. I recently received the Harmony circular set from KnitPicks (love them!) and would like to develop a holder specifically for them. *Once I have the knitting items added to the shop, maybe do a little advertising on Ravelry? I've never actually paid for an ad, but this is probably the best way to start. They certainly are the perfect targeted audience. 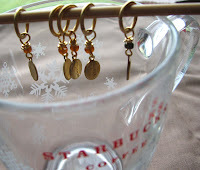 *Oh, and start donating $1 from each set of stitch markers that I sell to Susan G. Komen For the Cure. *Keep expanding the line of hand-carved rubber stamps. I enjoy making them and they sell well. They're a natural for expansion. *Now that Etsy has finally connected up with Google Analytics, I need to take advantage of that information. *Try to add more items made with upcycled materials. *I'm making a limited-edition 'zine for a swap and will have some for sale in the shop. The subject? Currently a secret. Check back at the end of the month for more details. *Redo my "Categories." Right now, they're sorted by media. I'm gonna try sorting by subject matter to see if it's more interesting. But if it's less useful, I'll go back to the traditional way of sorting. *Change up my banner and avatar regularly. Of course, stick with a recognizable look. But keep it interesting by highlighting different items, holidays, etc. So far, I've done this (see the banner at the top of this post), but need to keep it up. *Keep up with LinkReferral. I'm not sure that I've seen any specific sales from it, but it sure gets a lot of folks to view my shop. Since that's my main problem with Etsy -- the needle-in-a-haystack syndrome -- anything that gets eyes into my shop is a good thing. *Speaking of problems with Etsy, the painfully-hip-twentysomethings-in-Brooklyn thing is starting to get on my nerves. They're so horribly exclusive in so much of what they do. But they do have the traffic -- so I need to keep playing their game. However, I also need to put some energy into trying one or more of the alternative sites. So I'm thinking of trying 1000Markets, ArtFire, and FunkyFinds. Will you visit me there? *This is not part of my shop, but it's certainly related. My art/craft room desperately needs cleaning and reorganization. It's overflowing and needs some rethinking (along with a whole lot of cleaning). I'm too skeered to show you a "before" picture, but will show an "after" one if there ever is an "after..."
You have some very specific ideas here that should get you big results. Best of luck in 2009!